by George Evans Coat of Arms no 2 April 1950. 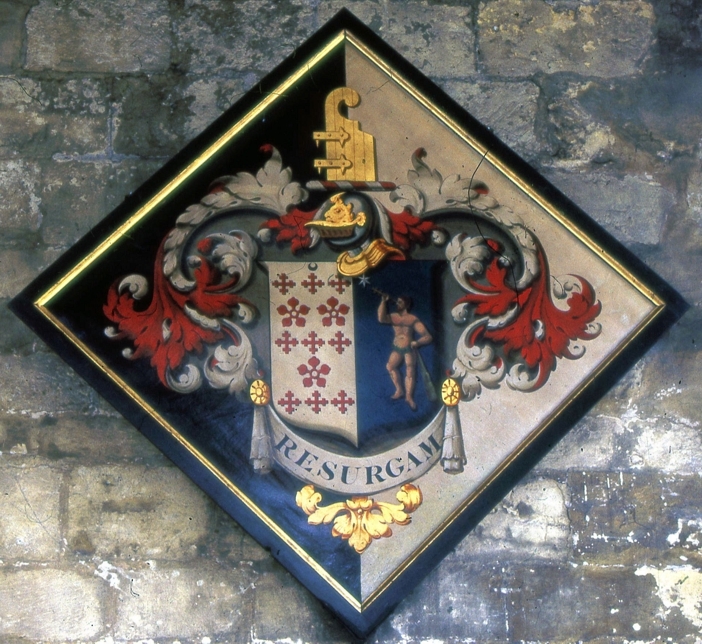 Among the many things of interest to be found on the walls of our parish churches up and down the country are those fairly large lozenge shaped Heraldic Paintings known as hatchments and usually painted on canvas within a wooden frame about 4 feet deep. The hatchment was originally displayed over the front door of the house of a dead person, whose arms it portrayed, and remained there until the deceased person was buried in the local church, whence it was then conveyed and hung on the wall of the nave aisle until a tomb or monument was erected. Fortunately for us, many of these hatchments were not removed after the tomb was made. 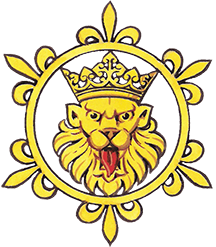 The subject of hatchments has only briefly been touched on in our heraldic text books, but by far the most interesting recent account comes from ” Intelligible Heraldry,” by Sir Christopher Lynch-Robinson, Bart. and Adrian Lynch-Robinson. The interest in hatchments lies in the background as well as the Coat of Arms, for the colour of the former will determine whether the deceased was a widower or a widow. The background will vary from all black to black and white halves. The custom developed for impaled arms that when the spouse was still living the background behind their half of the shield would be rendered white, as distinct from the black background of deceased person. The workmanship of these paintings varies considerably. Some were probably the work of local artists. The eighteenth century versions are interesting but for the most part of poor design. An interesting collection can be seen in Harefield Church (near Uxbridge), Middlesex, where also can be seen the famous tomb to the Countess of Derby with its fine Heraldic ornaments (1636). 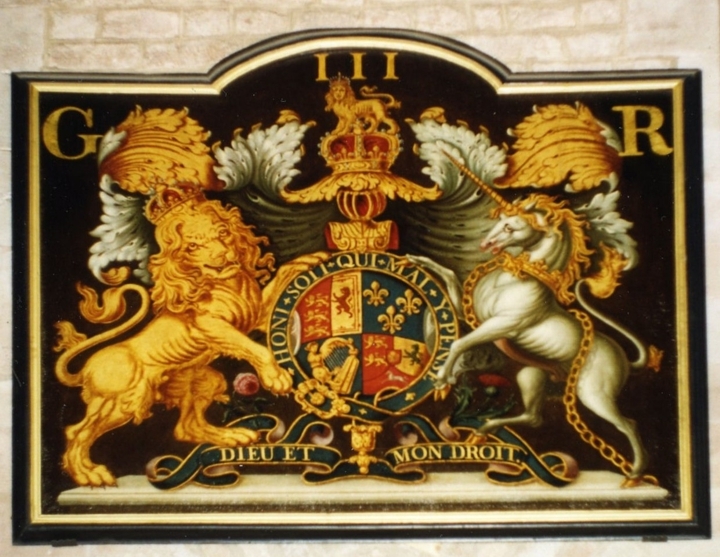 Not to be confused with hatchments are the rectangular paintings of the Royal Arms which were for the most part placed in churches at the Restoration, and this was compulsory. The Royal Arms were introduced into church decoration during Henry VIII’s reign when the Pope’s jurisdiction was repudiated by that monarch, who then made himself head of the Church of England. When Henry’s Catholic daughter succeeded him to the throne of England, nearly all these wall paintings were destroyed, but with the death of Mary I and the coronation of Elizabeth, these appeared again, only to be destroyed by Cromwell’s followers. With Charles II’s arrival on the scene, fresh paintings were prepared and many of these remain, and others have been added in subsequent reigns, although the practice was discontinued in the 19th century. At St. Ethelreda’s Church in Ely Place, Holborn, London, the Royal Arms panel will be found outside the Church on the wall. This ancient building was handed back to the Roman Catholic Church during Queen Victoria’s reign and the signboard of the King’s jurisdiction was therefore removed from the inside of the building.